Tension headaches are the most common type of headache. They usually cause a mild to moderate dull, achy pain. The pain can feel like a tight band around the entire head or occur in a specific area, such as the back of the neck or the base of the skull. Accompanying symptoms may include tenderness in the scalp, neck, and shoulders, fatigue, irritability, and difficulty sleeping. A number of factors can trigger tension headaches, including stress, insomnia, changes in sleep routine, depression, anxiety, skipping meals, poor posture, certain medications, physical inactivity, clenching or grinding teeth, or being in an uncomfortable body position for a prolonged time. In addition, conditions affecting the muscles or joints of the neck and shoulders and hormone fluctuations related to pregnancy, menstrual periods, or menopause can trigger headaches. Occasionally, headaches may indicate a severe medical condition such as a brain tumor or rupture of a weakened blood vessel, called an aneurysm. That's why if you are experiencing headaches, it's important to see your doctor for an evaluation. 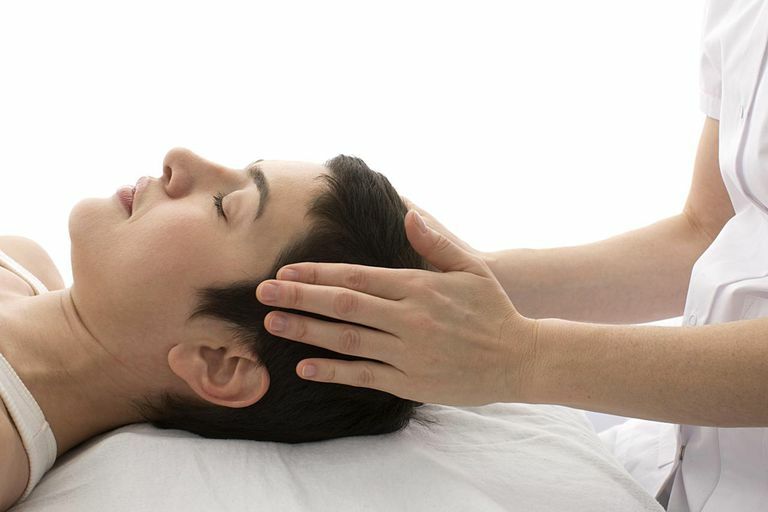 Complementary and alternative therapies are popular among people with headaches. In a survey published in the journal Headache, 110 people with chronic tension headaches were interviewed about their use of complementary and alternative therapies. Forty percent of people had used a natural therapy in the past, the most popular being chiropractic (21.9 percent) followed by acupuncture (17.8 percent) and massage (17.8 percent). Only 41.1 percent of those interviewed, however, perceived complementary and alternative therapies as being beneficial. Although studies have been conducted on acupuncture, chiropractic, and massage, there haven't been enough well-designed placebo-controlled studies to be able to conclude that any of these therapies are effective for headaches. Here is more information about each therapy. According to traditional Chinese medicine, pain results from blocked energy along energy pathways of the body, which are unblocked when acupuncture needles are inserted along these invisible pathways. Although we don't know exactly how acupuncture works, some of the theories proposed are that acupuncture releases natural pain-relieving opioids, sends signals that calm the sympathetic nervous system, and triggers the release of neurotransmitters (brain chemicals) and hormones. An acupuncture treatment generally costs between $60 and $120. Acupuncture is tax-deductible (it's considered a medical expense) and some insurance plans pay for acupuncture. Be sure to speak with your doctor before trying acupuncture. Side effects may include soreness, bruising, or bleeding at the needle location. Acupuncture may also cause temporary tiredness. Although rare, the needle may break or injure an internal organ or structure. Acupuncture may not be safe if you have a bleeding disorder or are taking "blood-thinning" medication. If you want to try acupuncture, plan on going one to three times a week for several weeks initially. Doctors of chiropractic are health care professionals that focus primarily on disorders of the musculoskeletal and nervous systems and the effects of these disorders on overall health. Emphasizing the healing power of the body, chiropractic is a hands-on approach most often used for neuromuscular complaints, such as back and neck pain, joint pain, and headaches. The hallmark of chiropractic care is the "spinal manipulation", which is also called a "chiropractic adjustment." The purpose of the adjustment is to restore joint position and mobility by manually applying a controlled force to a restricted joint. This restores proper function, relieves pressure on the surrounding nerves, reduces pain and muscle tightness, and allows tissues to heal. There are over 20 different adjusting techniques, which can be used alone or in combination. Side effects may include mild soreness, which should resolve within one to two days. People with osteoporosis, a history of spinal surgery, vascular disease, stroke, or symptoms of nerve damage such as numbness, tingling, or loss of strength should consult their doctor before seeking chiropractic. Many doctors of chiropractic also use other therapies, such as ultrasound, electric stimulation, massage, or soft tissue manipulation. Massage therapy is the application of pressure to the muscles and soft tissues of the body for relaxation and health. It is used for a variety of conditions such as stress-related illness, sleep disorders, pain, headaches, high blood pressure, diabetes, post-operative swelling, and depression. Massage therapy by a trained and licensed therapist is generally safe. Be sure that your massage therapist has your complete health history. People with cancer, recent or unhealed fractures, osteoporosis, rheumatoid arthritis, deep vein thrombosis, cancer, recent heart attack, burns or open wounds, or who are pregnant should speak to their doctor before having a massage. Side effects of massage may include temporary soreness, pain, and fatigue. Very rarely, massage may cause internal bleeding, temporary paralysis, and nerve damage, usually resulting from massage by an improperly qualified person. Fernandez-de-Las-Penas C, Alonso-Blanco C, Cuadrado ML, Miangolarra JC, Barriga FJ, Pareja JA. Are manual therapies effective in reducing pain from tension-type headache? : a systematic review. Clin J Pain.22.3 (2006): 278-285. Melchart D, Streng A, Hoppe A, Brinkhaus B, Witt C, Wagenpfeil S, Pfaffenrath V, Hammes M, Hummelsberger J, Irnich D, Weidenhammer W, Willich SN, Linde K. Acupuncture in patients with tension-type headache: randomised controlled trial. BMJ. 331.7513 (2005): 376-382. Rossi P, Di Lorenzo G, Faroni J, Malpezzi MG, Cesarino F, Nappi G. Use of complementary and alternative medicine by patients with chronic tension-type headache: results of a headache clinic survey. Headache. 46.4 (2006): 622-631. Vickers AJ, Rees RW, Zollman CE, McCarney R, Smith CM, Ellis N, Fisher P, Van Haselen R. Acupuncture for chronic headache in primary care: large, pragmatic, randomised trial. BMJ. 328.7442 (2004): 744. Ernst E. Manual therapies for pain control: chiropractic and massage. Clin J Pain. 20.1 (2004): 8-12. Is This a Tension or Stress Headache? Are You Having Tension Headaches? Is Excedrin Good for Treating Headaches?